Have you tried Ethiopian food? Packed with rich and flavorful spices, you’re sure to love it. I’m starting a series of posts with a primer on a few building blocks to many Ethiopian dishes. Think of them as vignettes on making an Ethiopian meal. First, an integral ingredient used in Ethiopian cuisine is berbere (behr-ba-rry), a ground Ethiopian spice blend that means hot in Amharic. This piquant orange blend of peppers and spices is generously used in spicy pots of wat (stew), meats, vegetables and other dishes. Aromatic, vibrant in color, full of flavor, and packed with fiery heat, berbere is not for the faint of heart (or taste buds). Flaming hot, delicious, and versatile in its uses, berbere can be used in marinades, seasonings for soups and stews, and vegetable dishes. 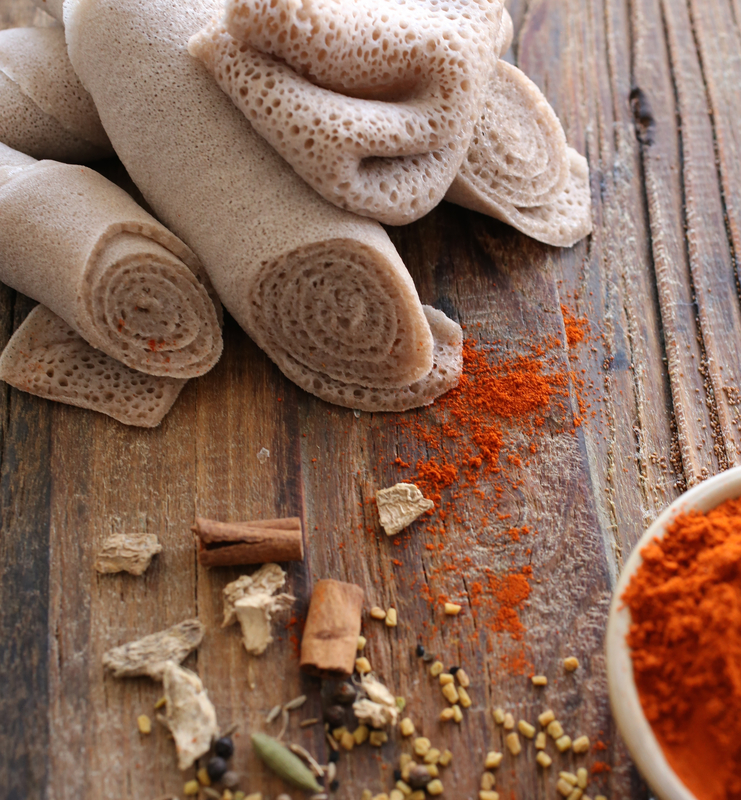 To make Ethiopian food, berbere is a key ingredient. 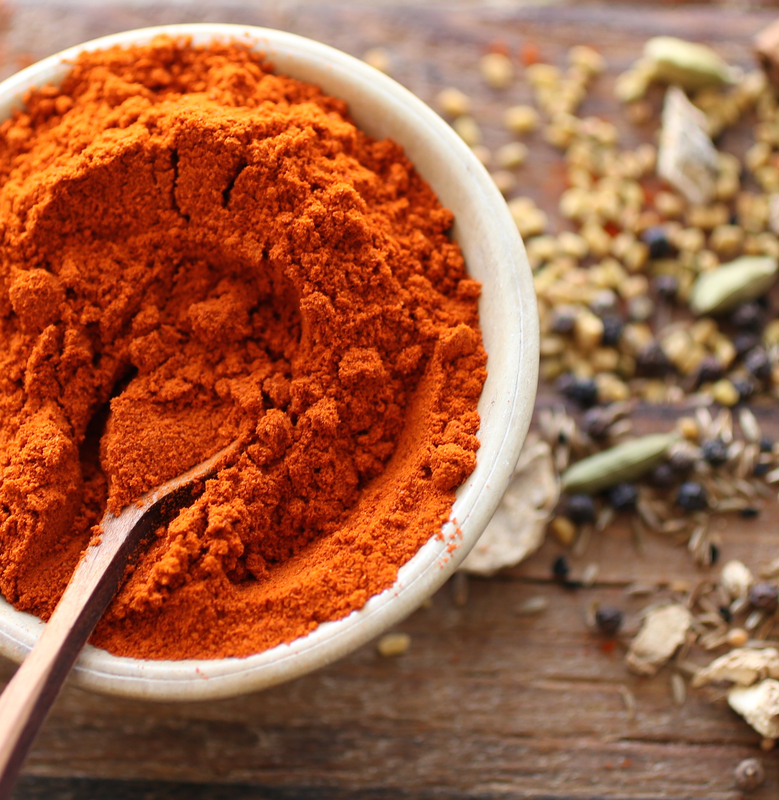 If you like spicy foods (and I’m talking REALLY spicy), berbere is a wonderful all-purpose seasoning you’re going to absolutely LOVE! Every Ethiopian cook has their own blend of berbere, some versions include lesser known spices that grow wild in Ethiopia, but key ingredients that make it the spicy flavorful seasoning that it is are usually the same. I bought my blend (photographed here) from a local Ethiopian market. They get their berbere from Qmem that sells a blend made of sun-dried chile peppers, red onion, garlic, cardamom, salt, ginger, nutmeg, cinnamon, fenugreek, black pepper, black cumin, cumin and other spices. The blend of spices remind me of My Masala Dabba. A dabba would be a great way to store berbere. 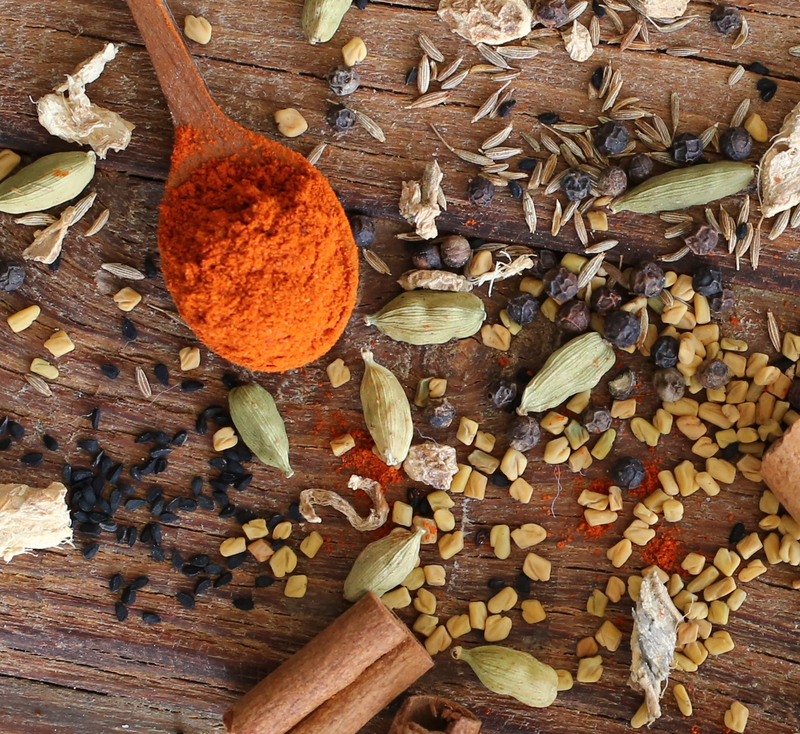 A quick online search can bring you to several websites that sell berbere—Penzeys, World Spice Merchants and Qmem are just a few. Or, you could also try to make berbere at home. In a mortar and pestle, crack the cloves into small pieces—this will allow them to disperse more evenly into the mix. In a heavy dry pan over medium heat, toast the cloves, coriander, fenugreek, peppercorns, ajwain, and allspice until they are are fragrant. Remove from the pan before they begin to smoke and allow to cool. Mix the remaining ingredients. Store in an airtight container and grind just before use. Stay tuned, more on Ethiopian cuisine to come! Wow, this looks incredibly delicious. I love different spice mixes from all around the planet, but I’ve yet to try this one! And those injeras look fabulous, can’t wait to see the recipe for that! Hi Darya, thank you! Sorry, I suppose my photo is a bit misleading. I didn’t actually make the injera you see in the photograph above. I had a neighbor teach me how to make Ethiopian food, but not even she (an Ethiopian woman) makes her own injera…. Like her, I very conveniently bought my stack at a local Ethiopian market run by her family. I’m in the process of trying to learn how to make it though. If I have any success, I’ll be sure to share any recipes and tips with you!! Thanks again! You’re very welcome. So glad you enjoyed this post! Beautiful! I really can’t wait to see your Ethiopian food. I realllly love it. That bread….did you make some?!! Hi Amanda! Thank you! Ethiopian food to come! As for the injera, I haven’t made it yet. I’m in the process of learning. If I have any success, I’ll be sure to share! Thanks! I’d love to check out your page and instructions on injera! I currently am in the process of learning. My counter is filled with teff and other flours. What is your site? Hi, I just checked out your site but I don’t see a recipe for injera. Do you have one up? I’m following this trilogy backward. Nonetheless, you have my attention. I find the series very intriguing and informative. Thank you for introducing this segment of Ethiopian cuisine. Thank you, and you are so welcome dear Fae! I am so happy this “trilogy” caught your attention and interest as Ethiopian cuisine caught mine. Thanks Barbara! Isn’t it just so much fun to discover new spices?!! I love berere and put it on a lot of things. Have you tried mitmita too? I wrote about it too. It’s another Ethiopian spicy spice. I too love spicy red lentils. So delicious! 😋 Thanks for the link!